From the A27/A22 Polegate roundabout, head eastbound on the A27. Take the 2nd exit at the first roundabout (after approx. 1.7 miles) onto the A22 and 2nd exit at the next roundabout, continuing on the A22. Take the 3rd exit at the roundabout (approx. 1.8 miles) onto Willingdon Drove. Go straight over the next roundabout (2nd exit) and then the 4th exit at the next roundabout to go back down Willingdon Drove. After 0.1 miles take the 1st left onto Hargreaves Road (just before Becks Peugeot). 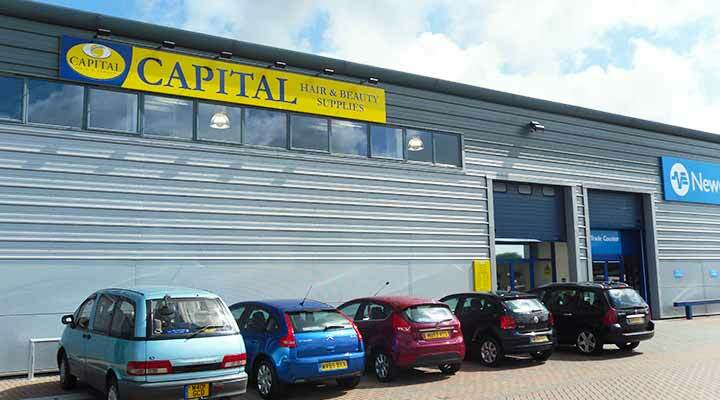 Capital Hair & Beauty is on the Hargreaves Business Park which is straight ahead of you. From the town centre, head north east on the A259 towards Cavendish Place. At the roundabout, take the 1st exit onto A2290 (Lottbridge Drove). Take the 2nd exits at the next two roundabouts continuing on the A2290. At the next roundabout take the 3rd exit on Willingdon Drove. After 0.1 miles take the first left onto Hargreaves Road (just before Becks Peugeot). Capital Hair & Beauty is on the Hargreaves Business Park which is straight ahead of you. Come and visit us at our store in Eastbourne! Meet our friendly staff and choose from the largest range of hair and beauty supplies in the area!